For a feeling of an old-time country market, step into one of the four Cotton Gin locations in Corolla, Duck, Nags Head or Jarvisburg. 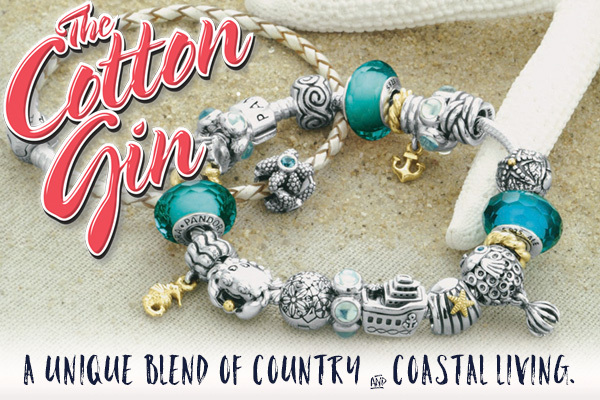 Our Cotton Gin locations carry many of the top quality beach brands you want with something stylish for everyone. The stores are filled with carefree clothing like Escapada, Vineyard Vines, Southern Tide and other top designers of accessories like Vera Bradley, Spartina 449 and Pandora jewelry. We also offer garden accents, bedding, seasonal decorations and well-known collectibles. Be sure to stop by our their main store in Jarvisburg, where the original Cotton Gin has stood in the same location since 1929. Here you will find fine wine made from our own estate-grown grapes at Sanctuary Vineyards, which is located adjacent to the store, as well as the Thyme and Tide Cafe with garden fresh cuisine. Try a sample of our estate grown wines, Sanctuary Vineyards has become an Outer Banks Tradition. Plan a visit to our winery on the mainland, it is just 11 miles north of the Wright Memorial Bridge.